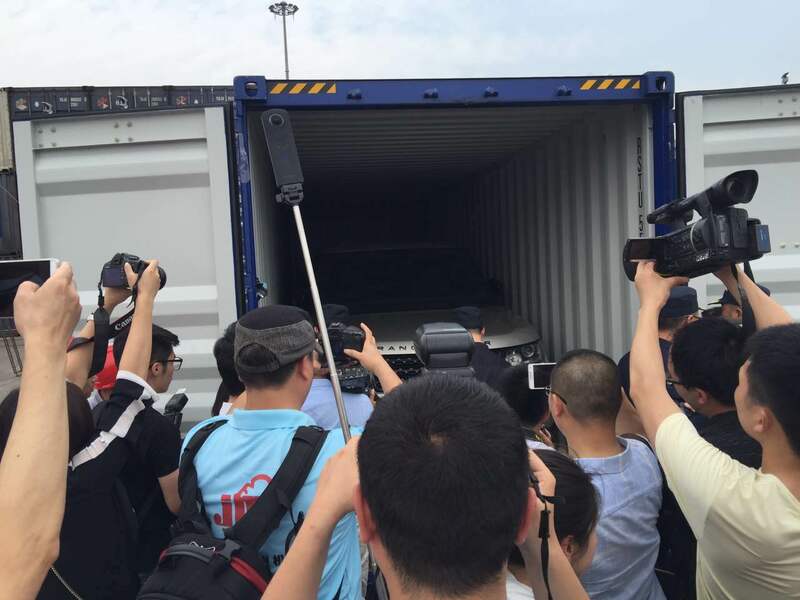 In the afternoon of June 13th 2016, the first China-European parallel imported vehicle train arrived in Chongqing, and the ceremony for train pick-up was held in Chongqing West Wing Container Center Station. Deputy mayor of Chongqing Municipal Government, Mr. Chen Lvping、Deputy secretary-general, Mr. Wang Yi、 Chairman of Rundong, Mr. Yang Peng and leaders of Municipal Commission of Economy and Information Technology(Municipal Logistics Office), SMFETC, Municipal Ports Office, SASAC, Chongqing Customs, Chongqing Inspection and Quarantine, West Wing Free Trade Zone (West Wing microelectronics industrial development Co.,Ltd. 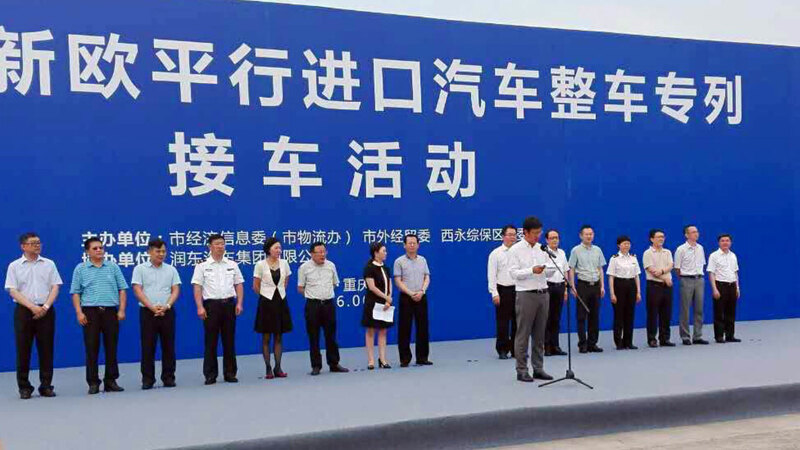 ), the CUIRC Chongqing Branch, Yuxinou International Logistics Co.,Ltd, Minsheng International Freight Forwarding Co.,Ltd., Export-Import Bank, Chongqing West Railway Station and more than 20 media representatives attended the pick-up ceremony. Parallel imported vehicle business is an important part of Rundong Group’s new business strategy segment, which is different from the original imported cars general agent mode, which has a positive and important significance to pull down the overall price of imported cars, to rich the configurations of imported vehicles and to meet customers’ personalized demand and other aspects. 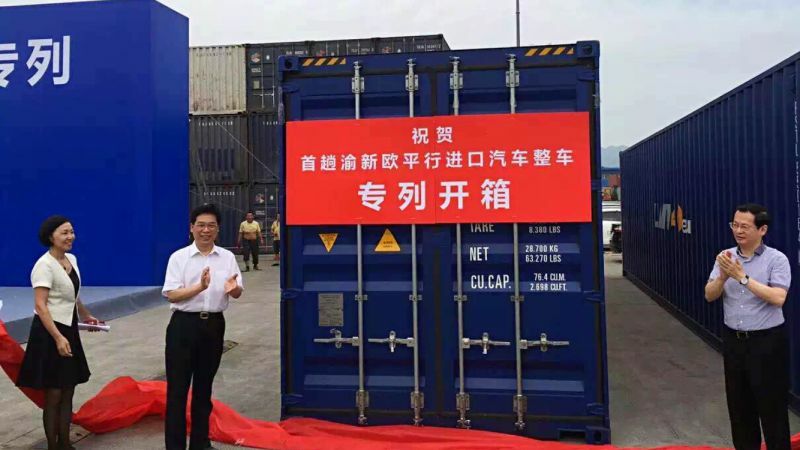 Rundong Auto Group invested West Wing to launch the first CQ-Europe parallel imported vehicles train, which is a successful breakthrough in domestic market of imported cars, which also indicates that the West Wing successfully get the trading corridor of parallel imported vehicles. As early as January 28th, 2011, Chongqing has gotten through the west path and opened up CQ-Europe International transport thoroughfare. Chongqing explored replicable and replicable experience to support the implementation of “The Belt and Road Initiatives”. In recent 5 years, Yuxinou advantageously facilitated and promoted the economic development of Chongqing. Its outcomes reflected in the followings: 1. Form a solid open platform. 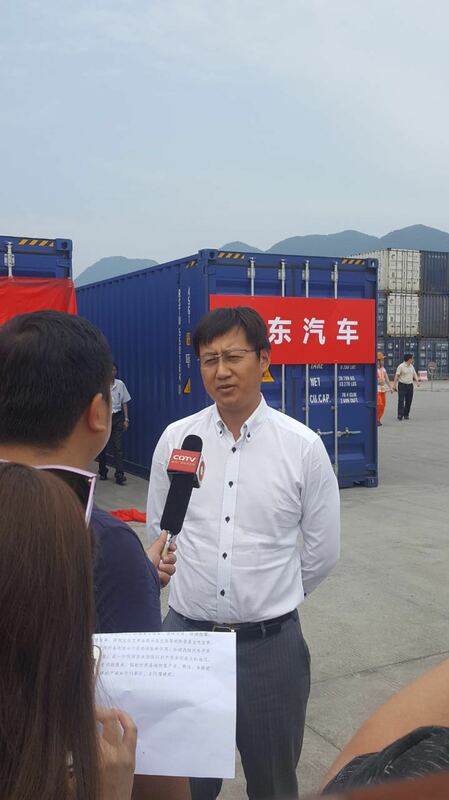 Chongqing have access to the policy support of national railway first-class port、imported vehicles port、bonded logistics center、preferential tariffs and transport international postal because of relying on Yuxinou. Chongqing has formed a “ three three in one” open platform; 2. Promote the restructuring and upgrading of the industry. 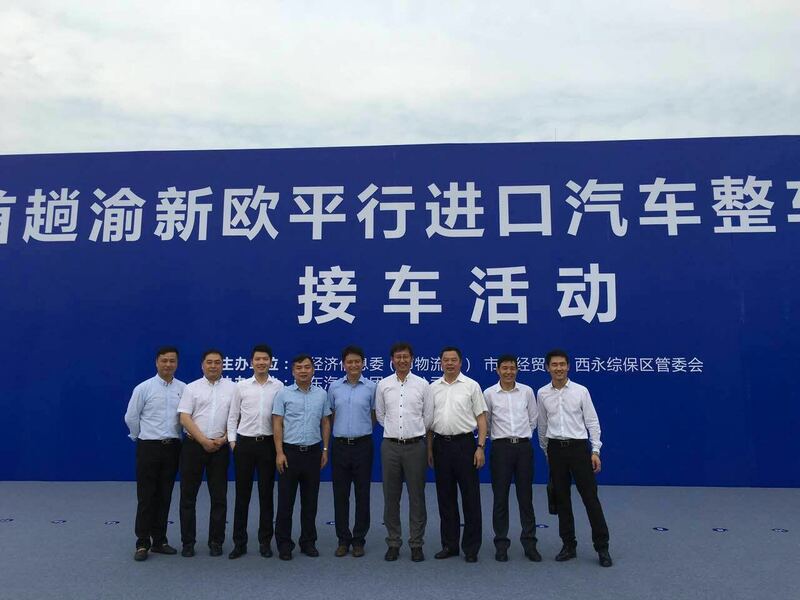 Yuxinou strongly promote the regional cooperation、industrial agglomeration and port economic development to effectively support the rapid development of IT、automotive、 cross-border E-Commerce and entrepot trade. The city formed a “6+1” industrial system leading by automotive, electronic information, equipment manufacturing, oil and gas chemicals, materials, energy and labor-intensive textile. Of which, the automotive industry built a “1+10+1000” cluster, the annual output exceeded 300 million units and the output value reached 460 billion RMB, accounting for one-eighth of the whole country; electronic products has become a “5+6+860” industrial agglomeration, the annual output of intelligent terminal is 270 million pieces, the production of the laptop accounts for one-third of global, the annual production value of the industry-wide is 570 billion RMB. The outputs of equipment, chemicals, materials, energy and consumer have all stepped onto 100 million RMB; 3. Stimulate and strengthen the cooperation with cities along. Currently, Yuxinou has lay out “1+N” mode and achieved the assembly and distribution of along 12 countries, it also break the logistics bottleneck of China’s inland, which has great significance not only for Chongqing but also for the Europe-China’s cooperation in economic trade and cultural. This train is the No.630 Yuxinou line, which is also the first special train for parallel imported vehicles. According to the customs statistics, the number of EU-China train started from Chongqing accounted for about 45% of the country, but the value accounted for more than 80%. 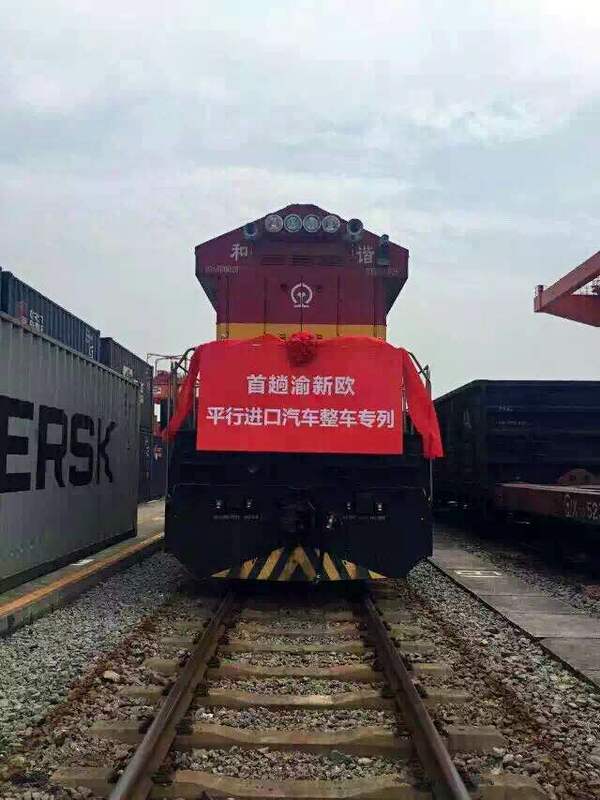 Today, this train is the first parallel trains since the opening of the International Railway Corridor train, which is co-organized by the West Wing Free Trade Zone and Rundong Auto Group, Minsheng International Freight Forwarding Company is responsible for carriage. The train started from Duisburg, Germany, via Poland, Belarus, Russia, Kazakhstan to Alashankou China, and finally to Chongqing West Wing Center Station. To achieve this breakthrough, City Logistics Office, West Wing Free Trade Zone and Customs, CIQ, SMFETC, Export-Import Bank and other enterprises actively innovative services, jointly carried out the car picking, international transport, customs clearance and other important parts for the parallel imported vehicles, and solve many problems to achieve a smooth opening of the vehicle train. The first EU-China parallel imported vehicles train arrives smoothly, which is an important open platform for West Wing Free Trade Zone. West Wing Free Trade Zone actively implements the municipal government to develop five special trading strategic plans and give full play to Yuxinou railway, Free Trade Zone and imported vehicle port’s advantages to set the goal of foreign trade and focus on the EU-China trading, vigorously foster building the West Wing European commodity mall and made it as the important breakthrough in imported vehicles trading center. This train kicked off the construction of West Wing imported vehicles trading center, which also had far-reaching significance for building a foreign trade base. West Wing imported vehicles trading center covers an area of 1.5 square kilometers, collecting imported auto dealers, repair workshop, tuning, training school and motor speedway. Currently, it has introduced of six well-known domestic imported vehicles trading enterprises and constructed the whole auto trading industry chain to form the ecosystem for imported vehicles trading and strive to build an important distribution center for imported vehicles. With the rise of parallel imported vehicles, cross-border E-Commerce, bonded goods exhibition and new format of foreign trading, West Wing Free Trade Zone is further consolidate in the high ground position. Relying on Yuxinou International Railway and other logistics platform, West Wing Free Trade Zone is accelerating the development of parallel imported vehicles, cross-border E-Commerce, bonded transaction, cross-border settlement and headquarter trading. West Wing will strive to play the function and role of each ports, accelerate to open the inland to highland construction. A landlocked hinterland, a radiation worldwide innovation area collecting the industry, logistics and financial advantages is shine rising.